Sandpoint Magazine, our town’s outstanding color glossy lifestyle and visitor magazine, is published twice a year in May and November. Each issue is loaded with great stories about Sandpoint, information on upcoming events, guides to dining, lodging, attractions, business directories and more. Sandpoint Magazine is published by Keokee Publishing of Sandpoint – we also produce SandpointOnline.com. If you like Sandpoint ... you’ll love Sandpoint Magazine. » See it online now, at SandpointMagazine.com. Get the real-life, hard-copy edition you can hold in your hands! A one-year subscription is only $12. Magazines are delivered in May and November. Subscribe online: Click to order now at Keokee Books. Subscribe by phone: Call Keokee Publishing at 208-263-3573 to order with credit card. Subscribe by mail: Send a $12 check to Keokee Publishing, 405 Church St., Sandpoint, ID 83864. Specify the issue you'd like to start with. 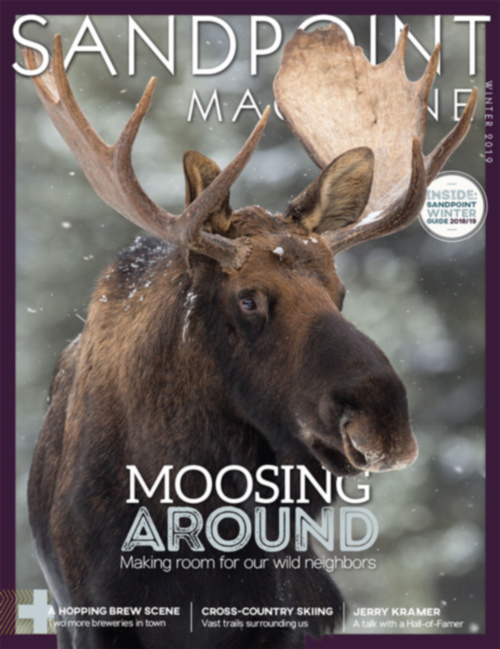 Sandpoint Magazine Winter 2019 Meet our wild neighbors! Learn about the MOOSE in town and out ... and WILY WEASELS. Go on to discover SIGNIFICANT MOMENTS in Sandpoint's history; or an outdoor gentle thrill, cross country skiing, the return of the region's native Salish language; the 'miracle' on Pine Street; and the retailers who are SURVIVING AND THRIVING downtown. Plus... don't miss stories on Sandpoint's HOPPING GROWTH as a craft beer town, the search for SEARS CATALOG HOMES, and an interview with newly minted Hall of Famer, JERRY KRAMER. Sandpoint Magazine Winter 2018 Stories include: Wintertime extremes. heliskiing operations from Selkirk Powder Company, extreme snowshoers, a drop-in to a backcountry cabin, our local youth skiers with SARS racing club, and at the other end of the spectrum the Prime Timers skiers ... Plus, terrific stories on a huge demographic gap here ... the "missing millennials" ... Q&A with Olympic skier Rebecca Dussault ... and so much more. Sandpoint Magazine Summer Stories include: Kayaking Magnificence, paddle full-speed into the kayaking boom on Lake Pend Oreille, with the story of a kayak adventure around the entire 111-mile shoreline 3 short trips and more. Plus Mountain biking and hiking; an octogenarian adventuress, Nicky Pleas; and even adventures in art with stone artist Mark Heisel, Interview with global mediator, Kenneth Cloke.Interview with Kenneth Clokeand Whinny Nicker Neigh” artist Shellby Young. Stories include: Wings of Winter Also in this issue:Interview with Super Bowl Champion Ron Heller, Urban Moose, Worldwide Help for Animals, Art of Megan Atwood Cherry, Housing Hardships, 100 Years of Ranching, Schweitzer's New Lodge, Shed Hunters, Calendars, Dining, Real Estate ... and an avalanche of others! Stories include: Dog Town with many dog tails included • Fun with an AmbassaDOG Contest • A September Sail on Lake Pend Oreille Saves Hey Jude • Cycling the Selkirk Loop • Deep in Pend Oreille. Also in this issue: Interview with Phi Center's Iris DeMauro, Food Farmers and Gardening, 50 Years of Rotary, Seven Generations of Country Gals, Train Depot Turns 100, Calendars, Dining, Real Estate … and so much more! Stories include: The Secret Lives of Fishes • Feature Interview with CIA spy, Navy officer and author, Leonard LeShack • BGH's future bright as health services grow • Also in this issue: World photography by Alan Barber … Sculptor Mark Kubiak's open-air museum … Diary of 1887 New York sportsmen on expedition to Priest Lake … Bonner General's expansion … Bonners Ferry, a town in transformation … an interview with Cold War spy Leonard LeSchack … a sensational Summer Nights photo essay… Sunset hikes … and more. Stories include: Schweitzer's First 50 Years • Interview with Christopher Boyce, Cold War-era Soviet Spy • Chasing the Light: Remembering Patrick Orton • It's Hyperbole and a Little More with Allie Brosh • Evolution of the Panida • Making the Town Tick with Kathy Chambers • Winter Glamping at Snyder Guard Station • Katie Adams Going to War for the Whales • Wintering Eagles • Unleashing an Artist: Patti Ragone • Sages of Sandpoint with Dr. Forrest Bird, Paul Rechnitzer, Charlie Glock and Joseph Henry Wythe, and real estate features on remote living and the city's first straw bale homes. Stories include: Return of the Wolf • Small Town, Big Ideas: Entrepreneurs Jason Giddings, Nick Guida and Fred Colby • Behind the Scenes with Eric Paull • A Photographic Dichotomy • Sandpoint on the Salmon • A History of Sandpoint in 10 Objects • Private Beach: Remote camping on Lake Pend Oreille • Thirty Years of the Cedar Street Bridge • The Die-Hard Players of Ultimate Frisbee • Bypass Bygone. Plus Ted Parvin Feature Interview, Carpe Diem Photo Essay, and real estate features on an Elliot Bay masterpiece and Belwoods 301 renovation. Stories include: Backcountry 3 Ways • Interview with Outside Senior Editor Grayson Schaffer • Nordic Skiing • Entrepreneurs • Artist Nan Cooper • Community theater. Plus Kinderhaven, Sandpoint as a college town, technology and the Schweitzer experience, Behind the Scenes with Carol Deaner, Backcountry Backyard Photo Essay, and real estate features on high-performance homes and historic architecture. Stories include: Mighty Osprey and Rare Animals • Interview with Astronaut John Phillips • Public Art • Potters • Arts & Crafts Fair • Mining Heritage. Plus hiking from lake to lake in the Selkirks, a photographic adventure on the Selkirk Loop, an excerpt from "On the Trail of the Ice Age Floods: The Northern Reaches," Behind the Scenes with Marcella Nelson, the Wild and Woolly Photo Essay, and real estate features on a Dover Point dream house, Canadians and the long-awaited bypass. Stories include: Six Great Winter Adventures • Interview with Klaus Groenke • Mustelid Search • Skijoring, Anyone? • Ski Obsessed • Adaptable Architects. Plus street naming history, avalanche hunters, artist Peter Goetzinger, Panida Forever, Behind the Scenes with Stephen Drinkard, the Panhandle Animal Shelter, Winter Love Photo Essay and real estate features on education and Sandpoint Forward. Stories include: Sculpted by Ice Age floods • David Thompson on the Columbia in 1811 • A Storied Fishery • Interview with Tinker Hatfield, Nike VP and Air Jordan architect • On Moving Waters. Plus cemeteries for history buffs, adventure motorcycling, Upper Priest River trails, Extreme Plein Air in the Scotchmans, Clark Fork's centennial, Jump! Photo Essay and real estate features on the Johnson farmhouse, planned communities, Taylor & Sons Chevrolet and old-timer Realtors. Stories in the 20th anniversary special issue include: A Lot Can Happen in 20 Years • Where Are They, Now? • Sandpoint in 2030? • ‘Mountain of Change’ Plus 20 • Ubiquitous Yoga • Bustin’ Through the Backcountry. Plus, Olympian Nate Holland interview, the local theater and teenage arts scenes, sidecountry skiing, Winter Nights photo essay, and real estate features on the past 20 years in the local market, personal spaces and the evolution of downtown Sandpoint, and much more. Stories include: Saddle Up • 100 Years of Grit and Glory • 1910 Fire Remembered • Activity Clubs • Loving the Lake • Interview with Bomshel’s Kristy Osmunson. Plus, Philanthropy in Sandpoint, hiking tales, artists Dan Earle and Jackie Henrion, Summer Storms Photo Essay, and real estate features on the Feehans’ mountaintop retreat, old-timer Realtors, PSB Community Plaza and business condos, and much more. Stories include: First Season at Schweitzer • Bonner General Hospital • Lake Whitefish in Pend Oreille • Fleeting Moments at West Fork Cabin • Immigrants in Sandpoint • Interview: classical guitarist Leon Atkinson • Plus, Sandpoint-Africa connections, Winter Tracks photo essay, and real estate features on Sandpoint as a retirement mecca, a haven for self-sufficient types and home to new commercial spaces, and much more. Stories include: Fat Tires and Life on Two Wheels • David Thompson Bicentennial • Sandpoint Transition Initiative • Hiking the Selkirks with an Artist • Change in Sandpoint: Education • Plus, interview with Intermountain Community Bancorp CEO Curt Hecker, road names that bear lasting legacies, a fuel-free adventure with five friends, an ode to the Sand Creek rope swing and much more. Stories include: Schweitzer: Launchpad for Snow Pros • Backcountry with Selkirk Powder Company • Sandpoint-born Sarah Palin • Interview: Paul Schaller, Quest Aircraft CEO • First Ski Descent in the Monarchs • North Idaho Winter Wildlife • Sandpoint Community Theater Comeback • Escape from the Dust Bowl • Plus, a Joy of Winter photo essay, daily painters, singing in the choir, then-and-now for SHS Valedictorians, the boom in thrift stores and much more. Stories include: Five Easy Sandpoint-Area Hikes • Sandpoint Archaeology Dig • Bonner County’s Last Dairy Farmers • Artists Lisa VanDerKarr • Lake Pend Oreille Book • Plus, feature interview with quarterback Jake Plummer, spectacular Pack River Delta, three decades of POAC, the Forrest Bird Aviaton Museum, and much more. Stories include: Schweitzer Mountain’s Giant Leap • Demographics of Change in Sandpoint • My Friend’s Fathers photo essay • Photographers Dann and Hazel Hall • Plus an interview with Schweitzer founders Jack and Dorothy Fowler, ice fishing, pioneer voices, Boots Reynolds, sled dogging, ice fishing, and much more. Stories include: 25 Years of the Festival at Sandpoint - It's a musical milestone, 25 years of music under the stars with the Festival at Sandpoint, along with stories about sold-out shows, poster artists, a festival-goer's guide and the season calendar. Plus: mountain biking; rock climbing; the Long Bridge Swim; an interview with political cartoonist Bill Mitchell; and more. Stories include: Tales from the Edge - Read about mayhem and magic on Schweitzer Ski Patrol in its 40-plus year history, along with an introduction to the new Schweitzer CEO Tom Chasse. Plus: snowcatting in the Selkirk Mountains; Sandpoint's first film festival; acoustic musicians on the rise; two backcountry ski adventures, and more. Stories include: Get Out There: 10 great adventures - Discover 10 outdoor adventures within an hour of Sandpoint, from paddling to flying. Plus: three painters who paint on different canvases; a rock climbing memoir; Patrick McManus and his first novel, "The Blight Way"; Quest Aircraft and the Kodiak airplane; Extreme Makeover: Home Edition; and more. Stories include: Hang Time at Schweitzer: Take a Flying Leap into New Terrain - The mountain opens up 400 acres of new terrain at Little Blue, along with a story on the telemark scene and a profile of General Manager Ron Nova. Plus: the spa scene; literary leanings; KPND after 25 years; and more. Wilderness of Water - A comprehensive recreation guide to Lake Pend Oreille, along with some history and literature about the great lake. Plus: literary scene, founding families, Georgia Shonk-Simmons interview, a pair of art features, an old-growth forests photo essay, and more. Stories include: In Your Face - Meet three of Sandpoint's top photographers and learn about what they do and how they do it. Plus: an exclusive interview with actor Viggo Mortensen, Sandpoint's year of discovery as the "West's best small town," a newcomers' guide to living in Sandpoint and more. Stories include: Wilder Walks  Author Dennis Nicholls recounts seven months spent hiking the Selkirks. Plus: Panida So Grand, expansion and history of the historic theater; Sandy Compton’s analysis and tips on local golf courses’ toughest holes; a fish seminar with Patrick F. McManus and Boots Reynolds; and two lakeshore real estate developments. Stories include: Schweitzer turns 40, a tale of two managers. Plus "Following Ross Hall's footsteps", Winter Wildlife, an interview with Frank VanderSloot, President & CEO of Melaleuca, Inc. Stories include: Wild Walks  lake hikes in the Cabinet Mountains. Plus: Guide to NORBA fat-tire races, kayaking, driving tours, Steve Willey interview, golf pros, Bookcrossing.com and choosing a contractor. Stories include: Hidden Schweitzer  hints to the super sweet spots. Plus: backcountry travel log, furniture as art, Shari Short interview, centennial film, ice recreation. Stories include: Swingin' Summer  1 great big beautiful lake, 2 fabulous float trips, 3 super swimming holes and 4 lovely little lakes. Plus: lookout tower camping, waterfall hikes, Scott Glickenhaus interview and remembering the Sundance Fire. Stories include: Got Snow? Here's nine ways to get out and enjoy it. Plus: sculptors of Sandpoint, nightlife, Reidar Wahl interview, Freeride Institute ... and a whole lot more. Stories include: Sandpoint centennial, a century of memories. Special issue. Plus: Maiden Rock and other lake-view hikes, Erik Daarstad interview, golf, lake play, real estate. Stories include: Blasting off the deep end. Schweitzer launches Northwest Territory. Plus: gallery owners on collecting art, skiing from Caribou Lodge, Dr. Foster Cline interview, planned communities, 10 years of Sandpoint Magazine. Stories include: Great grizzlies and other wild residents. Special wildlife issue. Plus: a '5 bear day' in the Cabinets, Bonner County fair, Delia Owens interview, woodland retreats. Stories include: Skiing into the future. New owners, new attitude, new thrills: it's a whole new Schweitzer. Plus: a century of Sandpoint, woven by family woodworkers, Marty Becker interview, ice hockey, log homes. Stories include: Paddling from the past to the present: river journeys in the wake of explorer David Thompson. Plus: the B&B experience, hiking the Monarchs, great golf in North Idaho and more. Stories include: Snowmobiling North Idaho Backcountry • Sandpoint Artwalk • Snowboarding Schweitzer Mountain • Backcountry Powder on Big Blue • A Tribute to Wild Rose Cinde Borup • Schweitzer Real Estate a Buyer’s Market • Plus a Guggenheim recipient, histroic buildings, sampling the brewpub, violin virtuoso Jason Moody, and more. Stories include: Historic Lake Pend Oreille Water Journeys • Football All-Pro Jerry Kramer • Festival at Sandpoint’s Gunther Schuller • Sandpoint Hikes • Holistic Architect Bruce Millard • Climbing Selkirk’s Chimney Rock • Plus historic Hotel Hope, Kootenai Wildlife Refuge, author Irene Bennett Dunn and much more. Stories include: Selkirk Mountains Ski Adventure • Actor and Writer Ben Stein • Cowboy Artist Nelson Boren • Priest Lake Snowcat Adventure • Schweitzer Mountain Legends • Literary Lion Frank Bartel • Plus, Sandpoint’s venerable Alpine Shop, community banking takes off, birth of Pend d’Oreille Winery and more. Stories include: The Kalispel Tribe and Lake Pend Oreille • A Lake Pend Oreille guide • Great Golf in Sandpoint • Hiking the Clark Fork-Coeur d’Alene Divide • A Tribute to Photographer Cap Davis • Detective Mark Fuhrman Interview • Plus, artist Barbara Jausz, wakeboarding on Pend Oreille, horse logging, extreme bike riders and more. Stories include: Photography of Cap Davis • Dream Days on Schweitzer Mountain • Snowboarding Comes to Schweitzer • Author Rick Bass Interview • Steve Willey’s Backwoods Solar Electric • Priest Lake Snowcat Motherlode • Plus ice climbing, Old Power House rennovation, metal artist Tammy Farmin and more. Stories include: History of Farragut Naval Training Station • Farragut Photographer Ross Hall • Farragut Park Now • Artist Stephen Lyman’s Last Interview • Hiking Scotchman Peak and Packsaddle Mountain • Plus a female bike champ, trends in building healthy, local bands, old-time cowboy Will McMain, Captain Curtis Pearson’s Shawnodese and more. Stories include: Who We Are: Sandpoint Fights Racist Label • Sandpoint’s Changing Demographic • Wild Roses Beth and Cinde Interview • Schweitzer Mountain on the Grow • Sandpoint’s Poetry Scene • Cross-Country Skiing around Sandpoint • Selkirk Mountains Snowmobiling • Plus, the Wolf People, Sandpoint oldest building, hot-shot videographers, Sandpoint’s Waldorf School and more. Stories include: All aboard, for a ride to railroad city: A history of railroads and how Sandpoint became "The Funnel" for all the northern tier railroads • Interview with humorist and author Patrick McManus • tree truths • Sandpoint's culinary maestros • Festival at Sandpoint's new Schweitzer Institute of Music • and more. Stories include: A feature interview with inventor and aviator Dr. Forrest Bird • 15 tips for skiing Schweitzer this winter • unsolved mysteries from Sandpoint's true crime annals • excerpts from the new book Kaniksu • Marianne Love's new book Pocket Girdles • the art of winter • and more. Stories include: Timber Town, USA; Sandpoint's historic roots as a timbering community • interview with the Dennis and Ann Pence of Coldwater Creek, back to the Continental Mine in the footsteps of A.K. Klockmann, a primer on huckleberries • great golf • Priest Lake hiking • Lake Pend Oreille's secret beaches • and more.